Tesla investors have already made a lot of money, and that could continue. But these three stocks could do far better. Here's why. While the past year has been very up and down for Tesla Inc. (NASDAQ:TSLA) investors, anyone who bought shares of the electric car, solar panel, and energy storage company before April 2017 -- or more recently, since April 2018 -- has enjoyed market-beating returns. But with a market capitalization above $60 billion at recent prices, investors seem to have already banked heavily that the company will accomplish much bigger ambitions, based on the current valuation. And while investors shouldn't count Elon Musk and Tesla out, it's never wise to put all your hopes -- and money -- on a single company. We asked three investors who write for The Motley Fool -- one of whom is a Tesla shareholder -- for alternative ideas -- stocks they think could put Tesla's future returns to shame. They put together compelling arguments for Clean Energy Fuels Corp. (NASDAQ:CLNE), Berkshire Hathaway Inc. (NYSE:BRK-A)(NYSE:BRK-B), and Codexis, Inc. (NASDAQ:CDXS). Jason Hall (Clean Energy Fuels): While EVs have gotten most of the headlines and attention from investors in recent years, Clean Energy Fuels has steadily grown its business of selling natural gas for transportation. And while its stock price fell sharply during the oil downturn, the company substantially grew the volume of fuel it sells. In 2013, Clean Energy delivered 214 million gallons of natural gas. In 2017, it delivered 351 million, a 64% increase, even when diesel prices were some of the lowest in a decade. And oil -- hence diesel -- prices are up sharply over the past two years. U.S. Retail Diesel Price data by YCharts. This bodes well for Clean Energy, which has also strengthened its balance sheet substantially over the past couple of years, and recently added a serious heavyweight to its corner, reaching a deal with energy giant Total, which took a 25% stake in the company, and also agreed to provide at least $100 million in support for a program to accelerate adoption of natural gas trucks. So while electric-powered trucks have gotten all the media attention, it will be several years before we even see trucks in fleets for testing, much less proof of commercial viability, while natural gas engines have a track record of reliability, and natural gas is substantially cheaper -- and far-less volatile -- than diesel. It's also far less harmful to the environment, and biomethane -- natural gas from sources like landfills and farms -- is even greener. Put it all together, and Clean Energy Fuels looks primed to generate substantial returns for investors in the years to come, while Tesla still has a lot to prove just to earn its current market value. 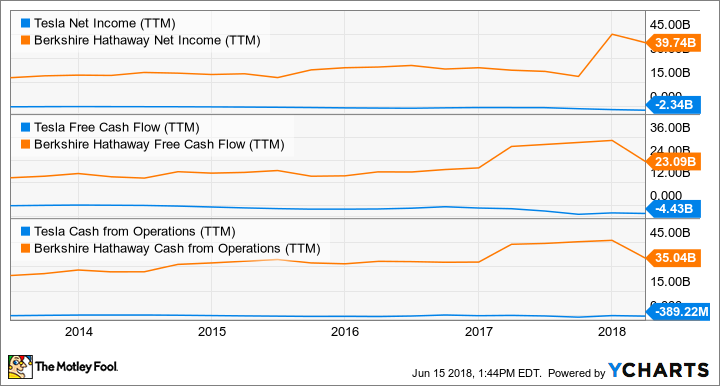 Chuck Saletta (Berkshire Hathaway): Although it's generally thought of as an insurance company, Berkshire Hathaway actually provides many analogous services as Tesla Does. The major advantage Berkshire Hathaway has, however, is the fact that it's profitable -- very profitable. Tesla offers green energy generation via solar panels -- and so does Berkshire Hathaway's utility subsidiary. Tesla produces environmentally friendly transportation via its vehicles, including its highly anticipated Tesla Semi for shipping goods -- and so does Berkshire Hathaway via BNSF Railway, one of the most environmentally friendly ways of shipping products around. Tesla also provides energy storage for later retrieval, and so does Berkshire Hathaway through Duracell batteries. And while it's not a perfect comparison (and obviously Duracell isn't competing with Tesla for energy storage,) with Berkshire Hathaway you get a company that earned over $40 billion in profits over the past year, has a very solid balance sheet, and is expected to continue to grow profitably. Contrast that with Tesla, which seems to be piling debt on its balance sheet and is generally hemorrhaging cash. Tesla's co-founder and CEO, Elon Musk, may have a tremendous vision for the future, and that vision has propelled his company to a better than $50 billion market capitalization and over $12 billion in annual revenue. But no matter how environmentally sustainable its product lines are, no business can survive over the long term unless it's financially sustainable as well. Unless Tesla finds a path to financial sustainability, there's little doubt that Berkshire Hathaway's shares will provide a better investment going forward. Maxx Chatsko (Codexis): I'm always careful to note that not all biotech companies (using biology as technology) are biopharma companies (using biology as technology in healthcare specifically), but Codexis is about to make that distinction even more difficult to explain. The enzyme engineering specialist focuses on designing and supplying proteins as inputs to industrial processes, which falls in the services or industrial biotech sectors -- not biopharma. But it decided to take its expertise and apply it directly to healthcare, by designing enzymes that could be used directly as therapeutics. The first drug candidate, which is taking aim at phenylketonuria (PKU), is poised to receive regulatory approval by the end of June to initiate a phase 1 clinical trial. It's an awesome development for investors. Why? In a word: diversification. Codexis' core industrial enzyme supply business is healthy, growing, and expects to deliver gross margin of 46.5% in 2018. The company has also built a sizable business selling licenses to its enzyme engineering software package to customers such as Merck. While the overall company isn't profitable yet, it's growing fast enough to erase that concern in a few years' time. Full-year 2018 revenue is expected to be around $61.5 million, or 23% higher than 2017. That's what makes the foray into the clinic so intriguing. Whereas most companies start with nothing and hope to find success developing novel drugs, Codexis has a completely separate and solid business supporting its efforts. That makes its partnered biopharma activities less risky and perhaps more lucrative in the event they succeed. 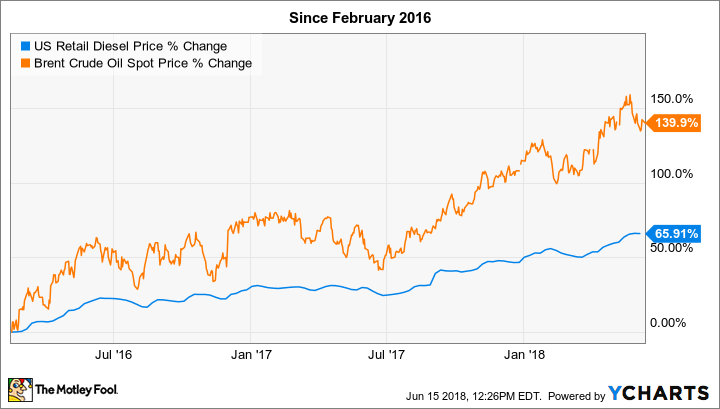 If the company can keep drug development costs under control, and delivers profits from its industrial enzyme business, then this stock could keep earning its way to a higher market valuation over time.